Jun-ichiro Watanabe of Hitachi Ltd. was thinking about easy-to-use interfaces for electronic devices when he thought - "Why not use a book as an interface device?" Books have lots of advantages as data storage devices - they've been popular for about two thousand years. Bibliophiles call the style of book we use today - a set of pages bound together - a "codex." The word "codex" is derived from the latin word "caudex" referring to the trunk of a tree; the pages grow from the spine of the book like like the branches of a tree grow from the trunk. Unlike a scroll, a codex-style book is a random-access device; you don't need to unroll it to get to a specific page. It is easily held in the hands; it is easy to see how much material there is. For example, you can't tell by looking at this page on the Technovelgy site that there are about eight thousand other pages to look at. Watanabe created a "book" that can be used to search through and easily access content as varied as radio stations, TV channels and bookmarked web sites. In his design (shown above), 0.8-mm-thick light dependent resistors (LDRs), which measure brightness, are attached to each page and the front and back covers. Opening the book turns on the electronic device (like a TV). When the user turns to a page, the channel corresponding to that page appears on the TV. The same principle is used to access different radio stations (by connecting to the radio) or web sites (when connected to an Internet-enabled computer). Apparently, Watanabe plans to research the use of electronic paper for the device. What he should really do is read science fiction author Neal Stephenson's 1995 novel The Diamond Age. In the novel, Stephenson provides details about the runcible, which Watanabe seems to be inching slowly toward. It had nothing ... on Runcible, whose pages were thicker and more densely packed with computational machinery, each sheet folded four times into a sixteen-page signature, thirty-two signatures brought together in a spine that, in addition to keeping the book from falling apart, functioned as an enormous switching system and database. Rather than using the book as an interface for a separate computer, the Runcible is both the book and the computer. MIT's Media Lab has also done some work on the same idea. 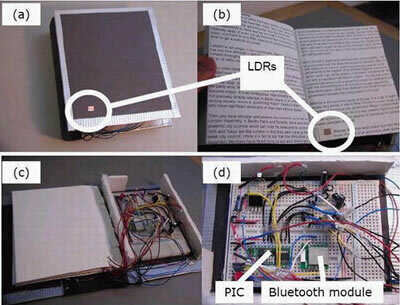 In a paper by J. Jacobson, B. Comiskey, C. Turner, J. Albert, and P. Tsao, they refer to "The Last Book:"
Such a book has hundreds of electronic page displays formed on real paper. On the spine are a small display and several buttons. The user may leaf through several thousand titles, select one he or she likes, wait a fraction of a second and open the book to read King Lear. When done with King Lear, another title may be selected; after the same waiting period, the user opens Steve Weinberg's General Relativity. As the reader might suspect, we need to completely reinvent the electronic display before considering such an endeavor. Mitsubishi has a prototype reversible LCD panel. You have your favorite book open before you, and read it without ever turning a page. Xerox is still looking for the perfect palimpsest. Read more about browsing media by flipping through a book; take a look at this early paper about The last book.